Chocolate on chocolate on chocolate. For the chocolate fiends we're proud to announce the release of our Hunka Burning Love Chocolate Buttercream Cake. Anyone within a hundred mile radius of Ann Arbor knows about this cake. It's perpetually near the top of our pastry popularity list because of the one thing it does right in multiples: chocolate. This cake is chocolate from top to bottom, all around and in between. There's not a spot of light on it, it's black brown everywhere: dense buttermilk chocolate cake, layered inside, covered in luscious chocolate buttercream frosting. The frosting is the showpiece. Traditional Swiss style buttercream, it's made by whipping fresh eggs and sugar into a meringue, then mixing in real Wisconsin butter and Madagascar vanilla. Our cakes are also marked by what they don't contain: no artificial anything, no mixes, no shortening. These are the ingredients your grandmother would use when she baked. Ships frozen. Remove the plastic while cold, then defrost and serve at room temperature for maximum flavor and attractiveness. 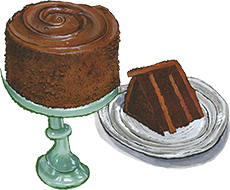 "[I]ndulge in a truly decadent dessert, Hunka Burnin’ Love Cake. The [three]-layer double-chocolate cake is a signature of famed Zingerman’s Deli in Ann Arbor, Michigan, and won’t fail to impress."